If you read the emails between Schools Chancellor Joel Klein and charter bigshot Eva Moskowitz, and I highly recommend you do, you get a vivid portrait of the moral bankruptcy that pervades Tweed. Apparently, all the stereotypical nonsense about neighborhood schools you hear from every charter troll on the internet comes right from the top. "Really could use your intervention," she wrote. "We need to quickly and decisively distinguish the good guys from bad. And yes take away resources from institutions that are harming children and give to those who are truly putting children first." Those of us who work at neighborhood schools are "harming children." Yup, we get up every morning and think about how to destroy the lives of the kids we're paid to teach. How can I make sure this kid doesn't learn fractions? Actually, Eva and Joel are very hopeful that no one understands fractions, as they spend a good part of their energy plotting how to take pieces of neighborhood schools. Klein's indifference to the neighborhood schools he supposedly runs is palpable. So while you teach in trailers, bathrooms, half-rooms, hallways, lunchrooms, and auditoriums, you need not ask what the Chancellor is doing about it. You and your students mean nothing whatsoever to him. He's content to let the walls crumble around you because his energy is spent making sure the likes of Eva Moskowitz get more money and more space. Screw the 98% of kids in public schools. Once they're a relic of the distant past, friends of Mike and Joel can really watch the money roll in. 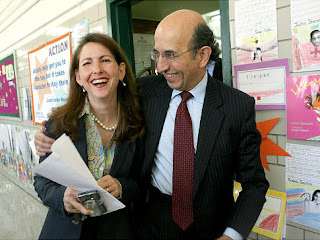 In fact, when Moskowitz demands space, Joel Klein's ready and willing to close public schools just so she can have it. Considering the blatant corruption and utter disregard for public education flaunted by Chancellor Joel Klein, it's no surprise that Mayor Bloomberg insisted on an utter dictatorship over the schools. When Moskowitz wants space, they label public schools irredeemable and set them to close. When the DoE ends up giving those same schools As on progress reports, they expose themselves as the hypocritical mendacious demagogues we've always known them to be. Mayor Bloomberg and Chancellor Klein are thoroughly amoral, working to line the pockets and promote the agendas of their equally unscrupulous pals. They both belong in prison for crimes against the children it's their job to represent.